Russia's Kremlin Diamonds and its most precious objects are currently displayed in the Russian Diamond Fund and the Kremlin Armory. Included in Russia's glittering line-up and famous collections are a dazzling diamond display, and the world's second largest "Orlov" brilliant diamond. Ten of the 47 Imperial Faberge eggs are kept in the Kremlin in Moscow and eleven reside in the Forbes Collection in New York. Now, the Kremlin Diamonds, lie in their darkened vault inside the Diamond Fund. Many of the pieces and the Kremlin diamonds in the exhibition, belonged to Paul I (reigned 1796-1801) and his wife, the Empress Mariya Fyodorovna, including the extraordinary Blue Diamond Stickpin which was originally a ring. After the French revolution, the blue diamond disappeared, and was re-cut twice, losing almost 20 carats in size. This 7.6 carat diamond may have come from the stone when it was re-cut. The famous Le Tavernier was renamed after its final cutting, and is now called the Hope Diamond on view at the Museum of Natural History, Smithsonian Institution, in Washington, DC. a word of warning, Trying to find the State Diamond Chamber where some of the Kremlin diamonds are vaulted, requires the tenacity of an adventurer and the instincts of a hunting dog! The Moscow Kremlin, together with the Red Square and Alexandrovsky Park, is one of the largest architectural ensembles in the world and is now also a UNESCO World Heritage site. When you think about the state of Russia, with its hundreds of millions and a land exceeding that of the whole of Europe, it's vast possession of raw materials, then it's no wonder that the Kremlin diamonds with the other Russian imperial jewels, a dazzling encyclopedia of Russian history, would be locked away behind the walls of the great Kremlin palace. The ancient fortress was originally the czars' power center from the mid-1500s until Peter the Great moved the Russian capital to St. Petersburg in 1712. And what a celebration of Russian power these ateliers produced! The treasury holds one of the most famous collections of jewels on earth, especially notable for its - Diamonds. Considering diamond-mining is a relatively new activity in Russia, this Imperial Diamond Collection is a bold statement in itself. 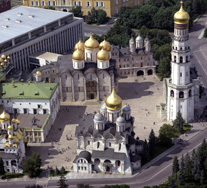 The Kremlin's Armory contains exquisitely sculptured Fabergé eggs, gilt and filigree encased gospels and everything precious that had been produced in the Kremlin, and gifts from foreign sovereigns and Russian nobles. The Orloff Diamond in the center of the royal scepter of gold, silver and enamel is one such gift. Behind the door marked "Almazny Fond" you enter the two rooms that comprise the publicly-accessible portion of the Finance Ministry's treasure-trove. It starts with some raw gems, heaps of brilliants and cases of elegant modern jewelry, but the most interesting historical objects are yet to come. The central showcase in the second room contains the Russian Imperial Regalia. Europe's largest cut diamond, the "Orlov" or "Orloff" (on the scepter). The legendary Orloff Diamond weighs 189.62 carats. Collectors of fine Antique Indian Jewelry know that the purest diamonds came from India. And indeed, India is the exact place that this extraordinary beautiful Diamond calls home. Back in the 17th century the diamond was set as the eye of Vishnu's idol (one of the Hindu Gods) in a sacred temple in Srirangam. In 1770 Count Orlov, an ex-lover of Empress Catherine the Great purchased the diamond for 400,000 rubles and presented it back to Russia hoping for Catherine's favor in return. Grigori Orloff in exchange for the Orloff diamond was given a marble palace but never succeeded in gaining what he desired the most - Catherine's love.